It was first during the 1930s that Sweden became a net-immigration country. This was, however, not an effect of an increased immigration, instead the emigration almost disappeared. A free labour market between the Nordic countries with the exception of Iceland was established 1954 and this stimulated especially the immigration from Finland. During this decade the colonies of Italians and Finns grew as a result of an increased demand for ‘blue collar’ workers but also due to refugee immigration from Hungary. Immigration during the ‘Great Immigration Decade’ in the 1960s was dominated by labour import. In the late 1960s the ‘free’ immigration policy was questioned the Swedish Trade Union Confederation when the industrial business cycle turned down, followed by a more restrictive and selective immigration policy. Labour immigration decreased and the industrial districts lost ‘attraction’ from immigrants compared to other parts of Sweden and especially the metropolitan areas such as Stockholm. As a result, in the period between 1970 and 1985 the major immigration patterns changed from labour immigration to refugee and family immigration. Since the 1980s immigration to Sweden has been dominated by refugee immigration and tied-immigrants (see e.g. Lundh and Ohlsson, 1999, Andersson 2006b, SCB 2006). In an effort to minimize the concentration of immigrants residing in the metropolitan areas the Government launched a “countrywide strategy for refugee reception” in 1985 which aimed to disperse immigrants across Sweden (SCB 2006), as well as to shift the responsibility of the new immigrants from the Government to the municipalities. The strategy was partially abandoned in 1994 since evaluations showed that secondary migration tended to re-localise immigrants in the metropolitan regions. Refugees are today more spread over the country than labour immigrants as a consequence of the localization of the refugee centres (Johansson & Rauhut 2007; 2008). However, labour immigrants and refugees are increasingly headed for the large cities and metropolitan areas where a large amount of service jobs are available in the lower labour market segments which is especially ‘attractive’ for newly arrived immigrants. During the period 1998 to 2012 the population in the Stockholm County increased on an average annual basis with 1.26 per cent. Both the Swedish born and the foreign-born population have increased on an annual basis and in 2012 the share of foreign born was 22.2 per cent. The composition of the foreign-born as a group is transforming as foreign-born groups, such as the Finns, that are not supplemented by new immigrants are ageing, while new groups increase rapidly, such as the Syrians, Iraqis and Chinese. Figure 1: Population development in the Stockholm County 1998 to 2012 – Swedish born and foreign-born. On the county level, the diversity index is 0.61, but there are huge variations both in terms of shares and numbers. 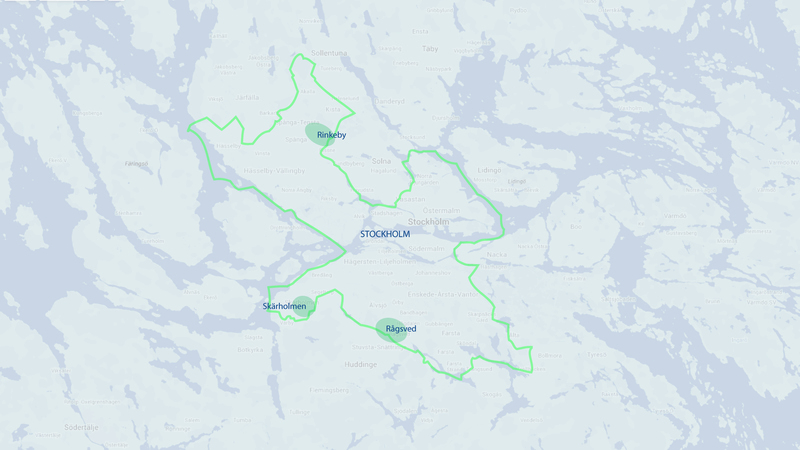 Foreign-born tend to be overrepresented in neighbourhoods located in the south western and north western municipalities and boroughs of the City of Stockholm, while they are underrepresented in the peripheral parts of the county and especially in the northern and north-eastern parts of the county. Neighbourhoods where foreign-born already are highly overrepresented tend to become even more so over time. However, the vast majority of foreign-born live in areas/neighbourhoods in which Swedish-born and foreign-born are more evenly distributed. There are residents originating from more than 185 countries residing in the County of Stockholm. For historic reasons, the Finish community is the largest in the County of Stockholm. Other communities are increasing rapidly, such as the Iraqi, Polish, and recently Syrian. Already in 2006, the OECD Territorial Review concluded that the combination of low employment rates among foreign born in combination with a lack of skilled labour force due to ageing may inhibit future economic growth. In 2006, Sweden was one of the OECD countries with the highest share of unemployment among immigrants in relation to their share of the total labour force. The pattern with lower economy and employment rates for foreign born versus Swedish born appear to be further exacerbated when decomposing the foreign born into sub categories; it is obvious that foreign-born of extra-European descent face substantially larger hindrances to establish themselves in the labour market. 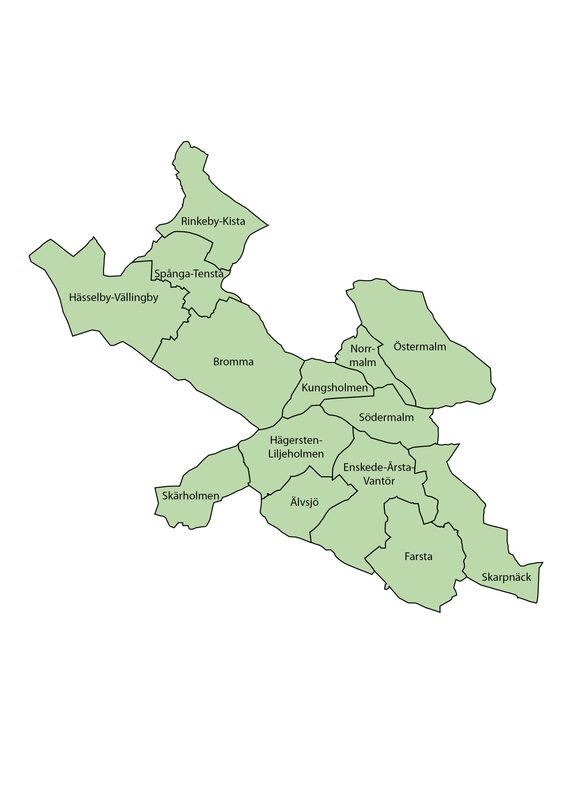 There are approximately 976 000 housing units in the Stockholm County. The different type of housing are private ownership (almost exclusively single unit houses), condominium (mostly in multifamily houses or terrace houses), and rental housing units in multifamily houses. The rental units are either provided by private landlords or by public housing limited companies. While in 1990 most housing units were rental due to a political shift since 2010 it is the condominium that predominates. Sweden does not manage social housing; instead there are housing allowances that serve to redistribute income to families with children and families with low incomes (OECD 2006). Map 3 shows the geographical distribution of the most immigrant dense neighbourhoods, including areas that have a high share and/or a fast expansion of non-Nordic residents in Stockholm County in 2005 (Andersson 2013:171). The darker the patch, the more immigrant dense or immigrant expanding the neighbourhood is. This map partly explains previous sections’ data on municipal levels: foreign-born residents’ tendency to settle down in the north western and the south western parts. Socio-economic factors, housing structures and especially the development of the labour market are the main driving forces behind the diverging ethnical segregation tendencies. One indication is the durable situation in which poor visible foreign-born groups have replaced native born Swedes and to some extent poor non-visible foreign born in the resource deprived urban neighbourhoods. The imbalances are most notable in the suburbs, especially some neighbourhoods that economically are the most disadvantaged and most dominated by visible immigrant groups. A report from Socialstyrelsen (2010) shows that about 40 percent of the adult population in these neighbourhoods are relatively poor and between 70 to 80 percent of people in working age are not self-sufficient. There are no high-income earner residents. On the other spectrum of the segregation, Sweden has neighbourhoods in which the conditions are reversed; areas in which only a few percent are poor, over 70 percent established in the labour market, and the proportion of foreign born is less than half of the region’s average. Swedish integration policy can be said to be three strains of policy areas that in different ways touch upon the issues of migration, migrants and integration/diversity. The first is the policy area of migration, which primarily deals with refugee and immigration laws and regulations, deciding under what terms a prospect immigrant will have the right to stay; the second is the area of integration which concerns how immigrants are introduced and received into the Swedish society. The third policy area is place-based and rather than dealing with the reception and ‘welcoming’ of the newly arrived immigrants it concerns one problematic consequence of the failure of the above – namely urban residential segregation and neighbourhood distress. The primary role of the national migration policy is to regulate immigration and reception of refugees. The goal of the national migration policy today is to protect the right to asylum and within the frame for the regulated immigration facilitate cross-border mobility, demand-driven labour force immigration, to collect and analyse the developmental effects of migration and deepen European and international collaborations (Faktablad 2013). The first regulation of immigration to Sweden was set in 1968 (Proposition 1968:142:97), with a remark that immigrants were to uphold the same standards and inclusion in the welfare state as the rest of the population (Borevi 2004). The outline of Swedish immigration policy is determined by the need for labour, but also by solidarity when international conflicts and tragedies have occurred (Demker & Malmström 1999, Lundh 2005). Current Swedish integration policies are transsectorial since its objectives and goals transect various policy areas. This implicates that several Government ministries and agencies are involved in execution of initiatives, monitoring and evaluation efforts. The first regulation of migration (prop. 1968:142, bet. 1968:StatsU196, rskr. 1968:405) held a universalistic integration perspective, safeguarding the individual’s right to uphold the same standards and inclusion in the welfare state as the rest of the population (Borevi 2004); in many ways that meant, as it still does today, labour market establishment. Already in 1968 the integration policy was divided between general welfare measures (individual universalistic) and immigrant policy mainly concerned with introduction to Swedish society and learning Swedish. In light of the historical development in Sweden it can be said that the main agenda for Swedish integration- and minority policies by tradition have been based upon assimilation, i.e. the immigrant must give up his or her cultural heritage and become ‘Swedish’ (Municio 2001; Borevi 2002; Bäck et al. 2012) The programs tell a different story, since most are of mixed characters, but surprisingly little attention has been given to explore the discrepancy between goals and measures (Dahlström 2004). The implemented measures have been minimally affected by the political agenda which has resulted in a number of constant and stable types of implemented measures that depending on the political agenda at the time are more or less in line with the political agenda (Dahlström 2004). One of recent history’s most impacting place-based measure was the construction of the Million Program Homes in the 1960’s to 1970’s. It can be argued that the program was a place-based ‘integration’ effort since its aims were to improve the physical environment and to provide adequate quality housing for the working class (Palander 2006), migrants from rural areas and labour immigrants from abroad. Thereafter, most of the forthcoming place-based policies and measures have been designed trying to reverse the ever increasing and complex social problems that persist in some of these neighbourhoods. Despite numerous efforts throughout the years the by now ‘wicked problems’ (see e.g. Williams 2012) have continued to escalate, illustrated by increasing unemployment, gaps between socioeconomic and ethnic groups (Palander 2006), as well as poor educational achievement, poor health, criminality and low democratic participation (Bunar 2011). The rhetoric in Swedish national place-based, or area-based, policies and measures has shifted from an explicit consideration of the ethnic variable to a position in which ethnicity is not included in either aims, goals or in the list of indicators that the Swedish Agency for Public Management is appointed to follow for the coming years. It has also moved towards a labour market and growth solution which was consolidated through the move of both integration and urban development to the Ministry of Employment. Another shift that has taken place is from the understanding of the problem as an issue of ‘segregation’ to one of ‘urban exclusion’. An analysis of national place-based measures indicates that independent of the change in terminology they are principally adhering to the same problem identification: The achievement of ‘integration’, conceptualized by the terms justice, labour and education for immigrants (Integrationsverket 2000, 2002). The place-based policies and measures also tend to focus on the individual rather than the structural level whereby local change has been hard to come by; change happens for individuals that tend to move away from the depleted neighbourhoods. The social-democratic ‘segregation’ terminology was not adequately targeted by their individual level measures. The centre-right Government’s choice of ‘urban exclusion’ however while remaining with similar measures as the social-democrats can be argued to have a more stringent connection between problem identification and possible solutions/measures. An individual level approach can however not claim to have any structural impact. Finally, place-based urban policies, whether they are called metropolitan or urban, are concerned with the ‘segregated’, the ‘’excluded’; thus the distressed neighbourhoods and their inhabitants (Andersson et al 2007; Björklund 2007; Tillväxtverket 2012). Never have they looked to the other end of the spectra by including the relational ‘other’ of ethnic and socioeconomically challenged neighbourhoods.